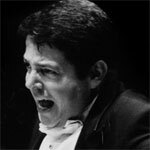 In 2003 Andrew Litton became the first American principal conductor of the Bergen Philharmonic Orchestra and the successful partnership was confirmed as his tenure was renewed in 2005 and he was made music director. During his time in Bergen Litton has taken the orchestra on tour both in Norway and abroad, including appearances in 2007 at the Concertgebouw in Amsterdam, Royal Albert Hall (the BBC Proms) in London and a 12-concert tour of the United States including Carnegie Hall, New York. Litton and the Bergen Philharmonic Orchestra also participated in the creation of a new Norwegian opera company, Den Nye Opera, and in 2006 performed Tosca as its opening production. The same year Andrew Litton stepped down as music director of the Dallas Symphony Orchestra after twelve highly successful seasons. He remains conductor laureate of Britain’s Bournemouth Symphony Orchestra, whose principal conductor he was between 1988 and 2004. He appears regularly with major orchestras and opera companies around the world, performing at prestigious venues and festivals such as Deutsche Oper Berlin and the BBC Proms. Andrew Litton has been artistic director of the Minnesota Orchestra’s Sommerfest since 2003, and was recently named music director of the Colorado Symphony.